Don’t be thrown by the title. 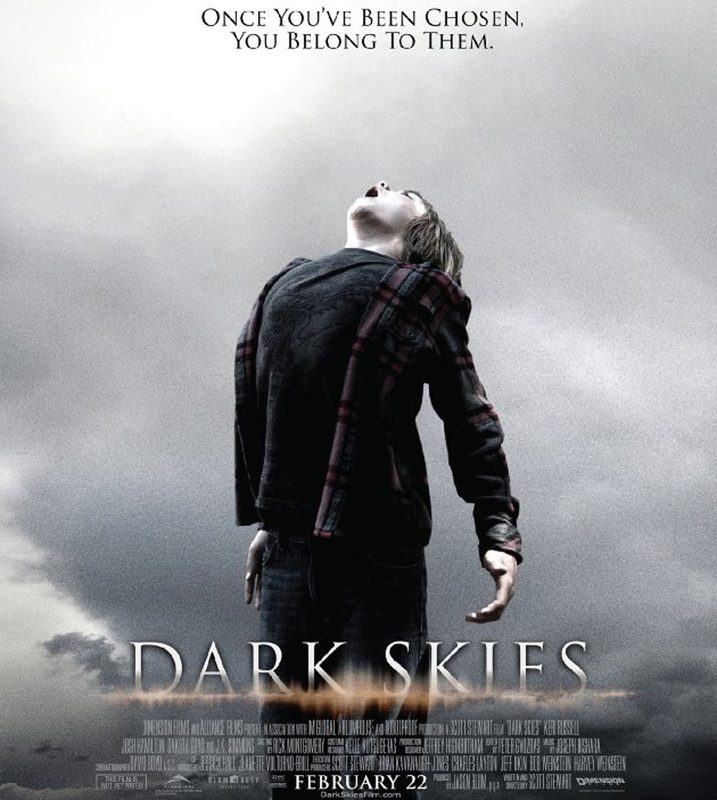 “Dark Skies” is hardly early Spielberg. Rather, it’s a close encounter along the lines of “Fire in the Sky” and “The Fourth Kind.” In other words, we’re in for one of those serious-minded textbook cases that takes an initially skeptical family and puts them through the wringer. By film’s end, they’re spouting as much tabloid gibberish as the proverbial Montana sheepherder who swears he was abducted by Metalunan saucer men. From director-writer Scott Stewart (the CG-driven “Priest” and “Legion”), “Dark Skies” initially surprises: It’s lyrical and restrained, punctuated by a lot of “Who’s watching us?” overhead shots. Stewart is not attempting “War of the Worlds” or “Battle Los Angeles.” His aliens aren’t bent on Armageddon; they’re more like pesky poltergeists: they start out frolicsome ‒ raiding the frig in the middle of the night, building kitchen sculptures out of canned goods ‒ and become increasingly destructive. When they do materialize, late in the second act, they’re not much more than static-inducing shadows with large almond-shaped eyes and spindly arms. Not to worry, from all reports they’re vegetarians. And who’s their target? The Barrett family of financially-stressed Suburbia, USA. Lacy and Daniel Barrett (Kari Russell and Josh Hamilton) are easy to mess with. He’s out of work; she’s a struggling realtor. They’re constantly at each other throats, which, not surprisingly, cause their two young sons (Dakota Goyo and Kadan Rockett) to have anxiety attacks and playground issues. Even if they didn’t have an alien-infestation problem, the Barretts would be the neighborhood pariahs. Which may be the reason the aliens chose them for study. Who’s going to believe a severely dysfunctional family when the seizures, high-pitched sounds and bird attacks start? Little wonder Dimension Films let this one out without benefit of critics screenings. It’s a fairly bland blend of sci-fi procedural and the original “Amityville Horror.” When the jolts do come, they’re of the cheap (hand on invitingly exposed shoulder) variety. You can’t fault Stewart for attempting a more atmospheric, Ray Bradbury approach to a well-worn genre. Too bad he, like Mrs. Barrett during one of her fits, is slamming his head against a sliding door.